Not all memories are created equal. Our memories for some very exceptional events seem to stand out in our minds, and as such they may form the very core of who we are. Perhaps you have a vivid recollection of a fateful day, an unforgettable face, or a hilarious joke. 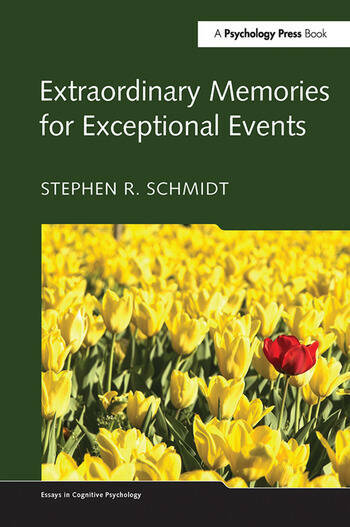 This book summarizes theories and data that provide insight into these extraordinary memories for exceptional events. The book begins with a classification scheme for exceptional events, followed by a theoretical overview grounded in four metaphors of memory. The classification scheme and theoretical perspectives are used to explore topics including: flashbulb memories, the influence of emotion on memory, the bizarre imagery effect, the humor effect, the serial position effect, and the isolation effect. The conclusion provides a framework for understanding these outstanding memories for exceptional events. 1. What are Extraordinary Memories and Exceptional Events? 2. Metaphors and Foundations. 3. Flashbulb Memories. 4. Emotional Significance: Laboratory Studies. 5. Secondary Distinctiveness: Memory for the Bizarre and Unusual. 6. Primary Distinctiveness: Escape from Monotony. 7. Summary and Conclusions: What Supports Outstanding Memories? References. Author Index. Subject Index. Stephen R. Schmidt received his Ph.D. from Purdue University in 1980. He was an Assistant Professor at Virginia Tech before joining the Psychology Department at Middle Tennessee State University. He was promoted to Associate Professor at MTSU in 1991, and Full Professor in 1996. He has served as coordinator of the Experimental Psychology M.A. program at MTSU since 1996. Professor Schmidt has authored numerous publications in the top journals of his field, including: Child Development, Cognition & Emotion, Journal of Experimental Child Psychology, Journal of Experimental Psychology: Learning Memory and Cognition, Memory, and Memory and Cognition. He has been an invited speaker at national and international conferences and has presented over 50 convention papers. His 1991 article concerning the impact of distinctiveness on memory has become a standard reference in the field, and he is considered one of a handful of experts on distinctiveness. He is also considered one of the few experts in the effects of humor on memory.